← A Change Is as Good as a….. Teacher By Profession….Mother For Life! 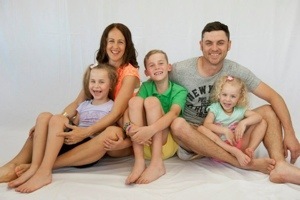 I’ve been a teacher for almost 11 years now…longer than I’ve been a mum! Before I had children of my own, my life was teaching and my children per say were my students! Pre-children I loved being a teacher! I would go to the ends of the earth to create a unit of work or innovating activity for my students to gain a learning experience from! I would spend my days being not only a teacher but a surrogate parent to some, nurse, psychologist and the like! I planned excursions, camps, multicultural events, coached netball and made many a phone call to parents regarding their child’s well being! Then I became a mum. My love of teaching never left me, but something did change and that is the way I think now! I’m not for one second trying to imply teachers who are mums are better than teachers who aren’t, but since becoming a mum, I look at things differently now and am quite a different teacher than I use to be! Pre-children I was such a control freak really when I think about it, but it worked and I always got the best results out of my students academically and behaviourally! I would ring a parent or refer a student for a problem and it didn’t affect me as bad as it does it does now! For the past few years I’ve been teaching in special Ed or behaviour positions so I’ve found myself in many situations where my heart has ached for a child…I’ve become such a softy and even though I’ve always been an empathetic person, now I’m a mum my empathy has changed if that makes sense?? I always think now imagine if that was my child or me receiving the phone call! I tread so lighting around parents now and how I approach a subject as the child in discussion is their baby just like I have babies! 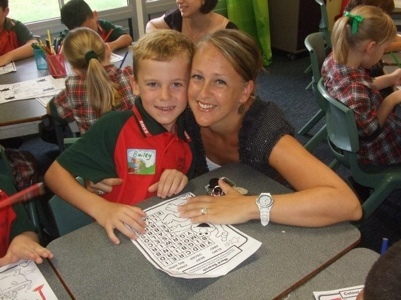 Being a teacher can be a good thing and a bad thing when you are a mum! We have a good knowledge of so many areas that can benefit our own children, but then we know too much about other things and the worst thing a teaching mum does is diagnose their own child! We spend so much of our time hoping and praying that our children aren’t going to struggle at school, when provided we allow a safe and supportive environment from the day they were born, we sometimes just have to realise we don’t always have control over this! Then that day finally arrives for your own child to start school and your professional role has to take a back seat while your mummy role takes precedent! 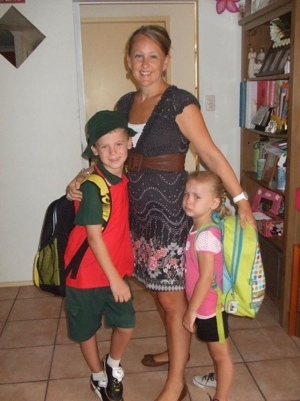 It was weird at first being a school mum. You feel as the ‘teacher’s’ child, they should always be the best role model and doing the best in the class! I soon let all those feelings go because I didn’t want to put my child under anymore pressure than what kids are already under these days! My son is in grade one now and up until last month I haven’t been in the position that I as a teacher have had to corner a parent during drop off or pick up! It was those handful of words that you dread to hear from your child’s teacher….”I need to speak with you!” I’ve been waiting for this moment though. You see my son Bailey has always presented a lot of behaviours on the spectrum and although he is perfect at school and leaves those behaviours and melt downs for home, I’ve been waiting for the call to let me know those behaviours have been presenting at school. Of course I expected the worst and any experience of being a teacher didn’t matter at all, as this time I was the mum being delivered the information. Thankfully it wasn’t anything relating to his behaviour. This one moment that a teacher took to speak to me though has led to a chain of events. She was concerned about his hearing and understanding what she was saying, we had a meeting with Bailey about this and things improved a little. I then took him to my GP to see if he needed an auditory processing assessment done, he noticed Bailey’s ears are full of fluid again and after having a hearing test, we found out that Bailey has a complete blocked ear and one that isn’t very flash! A trip then to our ENT ended in us now having to wait to see if the fluid will drain otherwise he will end up with his fourth set of grommets! My poor boy has obviously been sitting in class and not hearing things as clearly as he should. The mum in me wants to hug him tight and wrap him up in cotton wool, but the teacher in me is working hard to make sure he is in a learning environment that can cater to his needs at the moment! Thankfully Bailey goes to a wonderful school with a very supportive admin and his teacher is just fantastic! This situation has highlighted even more to me how important a teacher is in our children’s lives and more importantly how important it is a parent and teacher work together! proud of his achievements so far and as I read his first report card yesterday it brought a tear to my eye how awesome our son really is! I am a teacher by profession, but I’m a mother for life and I try everyday to make sure I distinguish between the two roles as best as I possibly can!